Today marked the Clan’s first ever harvest! 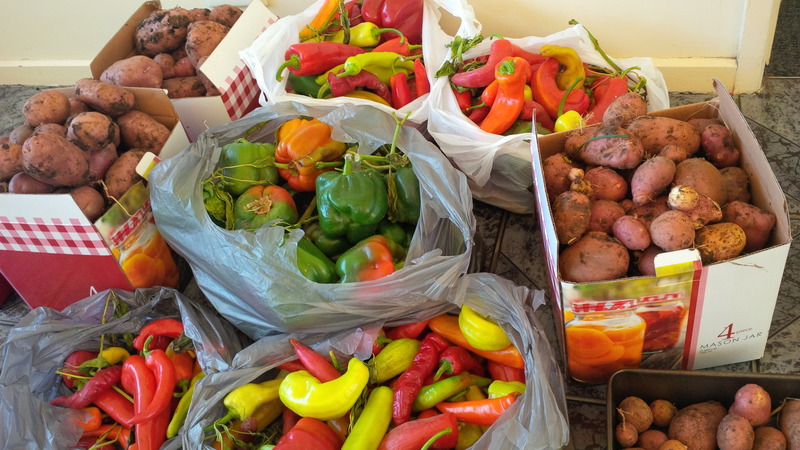 Although the garlic and onions got a little overrun by the capsicum, we’ve got enough capsicum and potatoes to keep us going for a while! 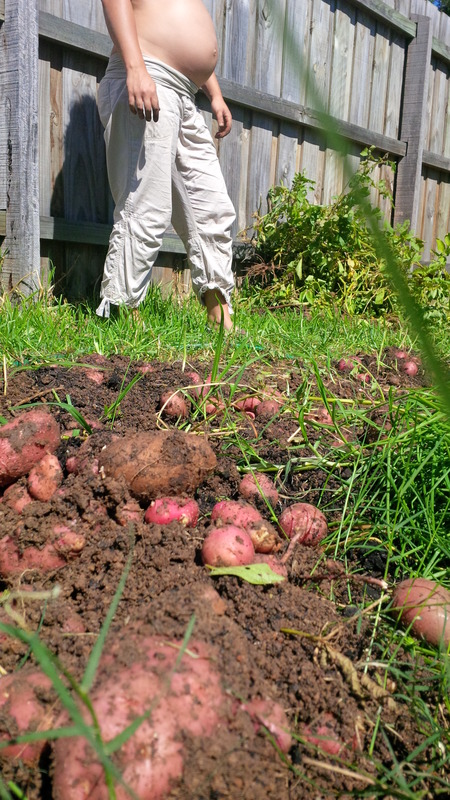 The potatoes of course will keep well as long as we put them in a dark and cool environment, meaning we’ve got a whole heap of organic backyard potatoes to munch on over the coming months. Capsicum, since we have so many, will provide Kristi the opportunity to try out some of those preserving skills she’s been learning on her adventures WWOOFing While Pregnant. It’s also worth mentioning that we grew some basil and chives, but we didn’t plant nearly as many of these. Both did well. The first major challenge we faced growing this year was keeping Ozzy out of the garden. He developed a particular affinity for digging up potatoes. It was at times frustrating, other times humorous. Most of the potatoes he dug up hadn’t sprouted yet but then one day he got one that had started growing and it truly freaked him out. 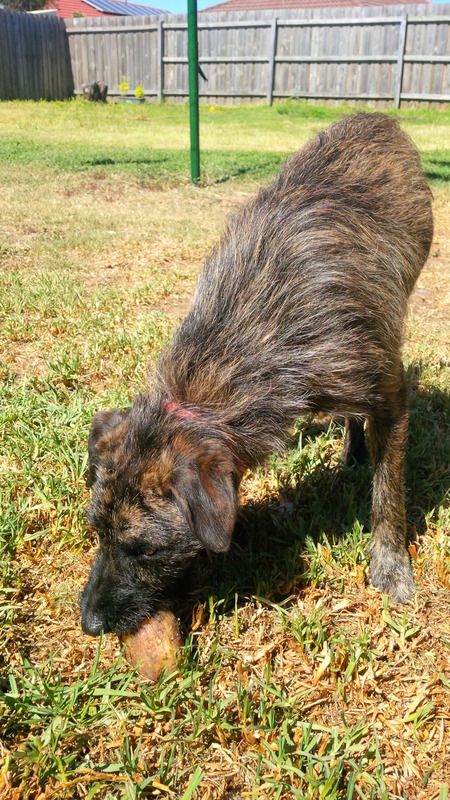 He was standing in the back yard intensely barking and growling at the alien-looking potato. There are a number of ways to keep animals out of the garden, the most obvious of which is to fence it off. Others include planting thorns or certain herbs they don’t like, but in the interest of time and given this is just a back yard operation, I opted for the Scarecrow – a motion detecting sprinkler that blasts anything that sets foot near the garden. This actually worked extremely well and kept Ozzy away long enough for the plants to grow big and bushy. Eventually the Made-in-China Scarecrow stopped working altogether, but at least it lasted long enough for our first crop. Periodically we would find potatoes that had been uncovered from the soil, not because Ozzy had dug them up but because the soil had eroded down. When potatoes become exposed to sunlight they spoil and become poisonous (you can tell by the color of the potato when you cut into it). While WWOOFing on David Arnold’s permaculture farm, I learned that keeping the garden well mulched would help prevent this. Grass clippings will both absorb water and prevent soil erosion. The capsicum actually grew so well that it overran the onions and garlic we had also planted in the bed along with it. We had read that these would make good companion plants, but in reality they didn’t survive. Another thing we learned at David’s farm was that onion really needs its own bed. This is something he said took him years to finally realize. Even though many books say you can companion plant them, they really only do well when with other Alliums. Despite Ozzy’s interference and some issues with the onions and garlic, we’re pleased with what we got. Can’t wait to see how the potatoes taste, and it’s reassuring to know we can successfully grow them. They are one of the best crops you can grow purely from a survival point of view since they produce high yield, keep well, and provide a lot of calories and nutrients. The dirt looks well following the harvest and we’re already looking forward to trying our hand at some other crops. Ones we’re considering are kale, cabbage, and chickpeas. We will also be trying our hand again at onion and garlic once the time is right. From the backyard: over and out.